Guess what? 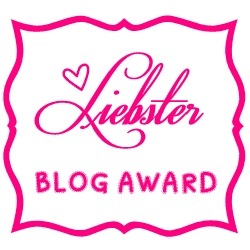 I got nominated for Liebster Blog Award. I'm so excited about it. It's my first award!! Yesterday while i'm having my supper and at the same time, hands on my Iphone to check my email. I'm so shocked to receive a comment regarding the nominated for Liebster Blog Award. It's like I can't believe someone nominating me. LOL. I was awarded by Athena ( Modestly Sophisticated ). If you haven't visit her blog, you should check it out now! At first I had no idea how to do it. I'm scared if I'm doing the wrong way. LOL. But thanks to her. She have the rules for the nominating thingy. Rules If You Are Nominated For The Liebster Blog Award. Tell 11 things about yourself. Nominate 11 new bloggers with less than 200 followers. Ask 11 questions to the bloggers you nominated. Inform the bloggers you chose. I want to travel around Europe, USA, or any other country one day. I love drawing. Anything. To wedding dresses. Cartoons. Graffiti. Faces. And more! I love eating. Yes. I eat a lot! I'm addicted to Pure Double Chocolate Ice Blended from Coffee Bean & Oreo Chocolate Ice Blended from Bubble Tea shop. I'm so obsessed with makeup stuffs! I do keep and write diary. My favorite color is PINK! I can go crazy with pink stuffs. SLEEPING :D Yes. I love sleeping. Who doesn't like sleeping right? 2. Most used item this month? 3. What new products have you tried lately that you'll repurchase and that you won't be repurchasing? - SATSUMA body wash from Body Shop and i'll repurchase it once finished. And, i won't repurchase again the Peel Off Mask by Himalaya. 5. Top 3 favorite pairs of shoes you own? - Birkenstock slippers, boots, and my black wedges. 6. Favorite hobby or past time? - Playing games or sleeping. 7. Which celebrity would you love to meet if you could? - 94 Extatique by Chanel. 9. What are the 3 top items on your current wishlist? - To ride on Cable Car. - Learning how to ride bicycle. Hehe. The feeling is like i just pass on how to ride motorcycle :D HAHA. Those were the days when i'm just a kid. 11. Do you plan on getting married? If so, where would be the ideal marriage destination for you? If already married, where would you love to live with your family if you could move anywhere you wanted? 12. What's your favorite thing about blogging? - I share my experience, my thoughts and anything on my blog. I'm done with answering all the questions. Thank you once again Athena for nominating me. If you had 1 wish, what would it be? What is your worst experience? What is your favorite foods? When you look back on yourself in the past, do you ever want to laugh? What do you wish you better at? What is your dream to be? If you can't sleep, what do you do? What is the most items that you must bring whenever you going out? Where do you wish you to live at? Who inspired you the most? Thank you once again Athena ( Modestly Sophisticated ) for nominating me. So ya, that's all for today post. Stay tune for my next update. Thankyou for the nomination ~ This has made me so Happy. I have already done the Leibster awards, But I am hoping to do a round 2! Feel free to drop any enquiry. To PR/Company who are interested in working with my blog, please feel free to email me. Thank you.